ORGANIC 120｜ORGANIC COTTON｜IKEUCHI ORGANIC Inc. Precision. That is the philosophy behind our towel manufacturing. We diligently make towels with precision and attention to the smallest detail. Organic 120 is our eternal staple, boasting great absorbency, great drying, and a long lasting great feel. It is the starting point of all our organic cotton towels at IKEUCHI ORGANIC. Carefully, accurately, thoroughly. 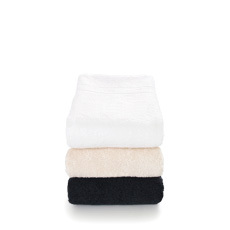 The meticulously calculated composition of a towel is what maintains long lasting softness. These towels combine impeccable absorbency with dependable durability. That feeling when you touch it. Yes, you know this is the one. Not too thick, not too thin. There for you every day, in time it becomes indispensable. That is the kind of organic cotton towel we make. When we are unsure or deviate in our pursuits, this is the towel we return to. Our starting point. This is precision made functional beauty. I’ve been looking for a towel this color. We want to make towels the color that you want to use, irrespective of organic or environmental burden. We provide a rich variety of colors so you can find a color that fits you perfectly. We dye colorful towels using chemical dyes in well managed, clean dyeing factories. The safest method of dyeing. 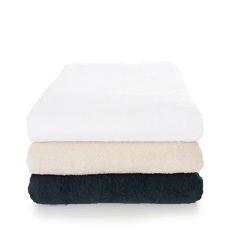 Towels are washed thoroughly and carefully to reduce discoloring to an absolute minimum. We guarantee beautiful colors that will not fade even after heavy use.